I first read The Mysterious Benedict Society back in 2008. At the time I finished it, I knew it was a book that everyone in the whole world needed to read. I've harped on and on and on about why you should read it, if you haven't. It is, in a word: awesome. 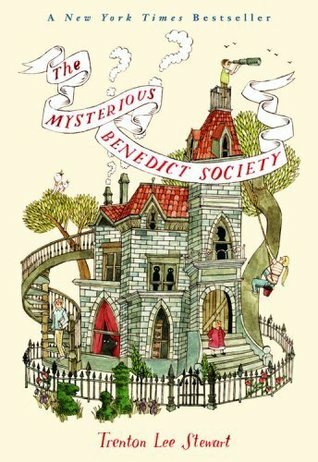 Re-reading The Mysterious Benedict Society was a very fun experience. (Except when you are re-reading it at the same exact time as your husband and you have to remember which bookmark is yours!) I gleaned more from it this time than I did last time. As I mentioned, it is littered with nuggets of truth - which is the point of the book to a great extent. I'm not going to repeat the plot in this review. (My friend offered a nice description if you'd like to read one.) Instead I'm just going to share what I pulled from it this time around. These four children were stretched by having to work with one another. They didn't always "get" each other's quirks. They flat-out didn't like each other at times. They discovered how hard it is to maintain a team spirit - and yet they did so by reminding themselves constantly that this is what they were required to do. They were not to walk away from one another, but each consider the other's special gifts and talents and they were to include and involve each other even when it didn't seem to make sense to do so. They were all needed and necessary in order to get the job done and they all benefited from laying aside self for the greater good. It is generally much easier to go about life in the Body of Christ is we just focus on doing whatever it is that we're good at. It requires a painful amount of sacrifice to walk away from an area you feel accomplished in - where you know yourself - and walk outside of your comfort zone. But if we stay inside our own little bubbles we can easily convince ourselves that we're doin' alright on our own. It's more easy to believe the lie that we don't need other people or that everyone else has a problem and we don't. (i.e., "Well, that's her problem, not mine!") Doing what we're good at is sometimes extremely necessary and at other times it offers a false peace - and a deadly one at that. To grow and mature we need to become a part of the Body of Christ - in all it's unique and frequently confusing glory. To die to self and live for Christ. It's the hardest thing in life to do and the Body, it frequently seems, is the hardest place to do it in. Yet we must learn to live and work together a.) because God told us to; and b.) because it is all for His glory and He will have it. I hope that if you haven't read it, you'll consider doing so. If you have read it, make time to re-read it. I cannot believe that you'd regret doing so! I've been asked a few times how old a young reader should be before embarking on this tale. I intend to save this book to read aloud until my oldest is eight. I think he'll have a greater appreciation for it then and will be able to comprehend more of the story. It's a bit beyond his five year old self but I think eight will do. This (once again) reminds me that I never got around to reading the rest of the series. Thanks for the reminder! Oh, and did you get Stephanie's (Simple Things) email?!?!?! I keep books on my desk that I definitely want to read soon, and this one has sat there awhile. :P I need an intervention to stop bringing in new books! I found The Gruffalo at a little thrift shop lately. It seemed somewhat familiar, so I grabbed it. We'll have to read it today and see what it's about! I've not read this yet...but I want to! I haven't read this book but every time you mention it I think, I need to read that! I'm putting it on my to-read and will look for a copy soon. I love these books so much! Thank you for the review and the reminder that these are lovely books to re-read! The author lives in my current "home town." I've helped him at the reference desk at the library. I haven't read this (Shame on me!) but our Mother/DAughter book club (11 yr olds) has chose this for our May selection. We've sent him a letter to ask if he would be willing to attend our meeting. Haven't heard back yet. @Melissa Gerbera Daisy Diaries - OK, well, I'm officially jealous. Terribly much so, yes. You're tempting me to read it again. . .I think I was so caught up in the fun story I missed the great points! You tempted me to request this at the library- we'll see if I get it finished. As I was reading this, I was just thinking, "I can't wait to share it with Kyle." He'll be 8 in May, and is a high-level reader. At his school, he has to read books on his "level" for quizzes, and I'm assuming he'll move up to the 5th grade level next year, which is where this one is, so I might encourage him to read it towards the end of 3rd grade. I think Amanda read it in 4th grade (rereading frequently as the sequels came out). Because of the dry humor and observations, I do think that's a good age for it. I love this book, too, but I, too, missed the spiritual parallels. Need to re-read. Maybe I'll read it to my 10 year old---who hates to read and would never read such a thick book on her own. According to my archives I read this in 2010. I remember liking it but not much else. In my review I recommended it for 10 yr olds. I may have to read this with my oldest soon. We were just talking today about our family being a team and helping one another rather than competing with each other.